Home / News / New Directions! Providing essential and innovative services and care for individuals, families and communities throughout Northeast Florida to prepare for and support graceful aging. Please visit our website for more detailed information about these events! 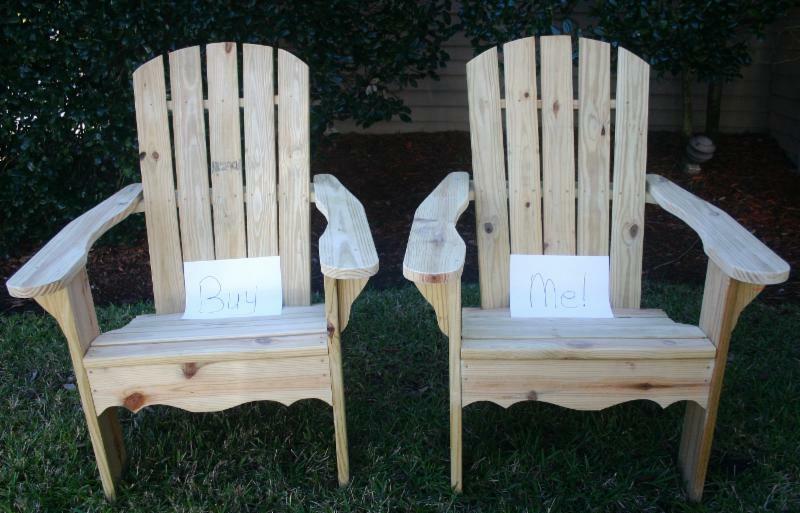 When you buy two handmade Adirondack chairs for $200, a donation of $200 will be made to Aging True to support senior independence! Call Jim Black at 904.525.6683 to order. Locally, Aging True has been selected as a beneficiary of this amazing new program! Visit www.aarp.org/membertomember to get started today! 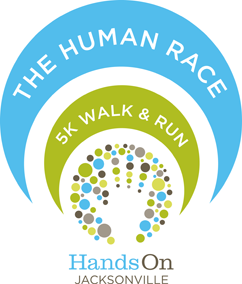 Register for the Human Race on April 4th and select Aging True from the registration drop down menu. 50% of the registration goes back to Aging True to support senior independence in Northeast Florida! 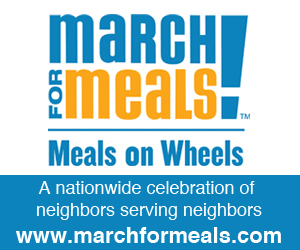 The 13th annual March for Meals campaign is led by the Meals On Wheels Association of America. This effort is a dynamic and effective partnership between the national network of local Meals on Wheels programs and the businesses, organizations, governments and volunteers who contribute so generously in their communities. It gives us all an opportunity to support our nation’s seniors in a variety of ways to make our communities stronger and healthier. We invite you to become a Community Champion in Northeast Florida and support your local Meals on Wheels program at Aging True! Hello and Happy 2015! I’m sure by now your New Year is in full swing. It surely is here at Aging True. After a wonderful holiday season made possible by the generosity of community volunteers we have jumped right into what is going to be a busy year. With the growing population of seniors in our community, Aging True remains committed to providing vital services and programs for seniors and their families. In addition to the latest happenings at Aging True, in this edition of New Directions, we are pleased to spotlight our grandparent’s program, RAPPJaxx. As most people know, raising children is not an easy task and it is even more difficult when you are older, facing health issues and sometimes financial strains. RAPPJax is just one of the many programs offered by Aging True that provide assistance to seniors and their families. Look inside this quarter’s New Directions to learn more about RAPPJax and all that is going on at Aging True. Also, think about how you too can get involved in helping to meet the growing needs of seniors in our community. We would love to have you join in our efforts to ensure senior independence! Holiday Volunteers Were in Full Force! The holidays are always a busy and fun time at Aging True Community Senior Services! Whether it’s one of our annual holiday volunteer events or a new project – we are thankful and appreciative of our community partnerships. November and December features our largest Meals on Wheels volunteer events thanks to the Thanksgiving and Christmas Day holidays. For 21 years we have partnered with St. Vincent’s Healthcare – Riverside and North Florida Transportation for the Thanksgiving Day meal delivery. 50 taxi’s and 100 volunteers came out early Thanksgiving morning to help cook, package and deliver meals 500 Meals on Wheels clients. Excited volunteers on Christmas morning! Christmas morning was spent with our friends at Congregation Ahavath Chesed and The Jacksonville Jewish Center. For the past 27 years, volunteers from these two temples have prepared nearly 500 meals on Christmas Eve and deliver on Christmas morning. The Thanksgiving and Christmas Day meal deliveries were made complete with thoughtful holiday cards decorated by students from Crystal Springs Elementary School, Big Brothers Big Sisters, Empowerment Resources and local Girl Scouts. 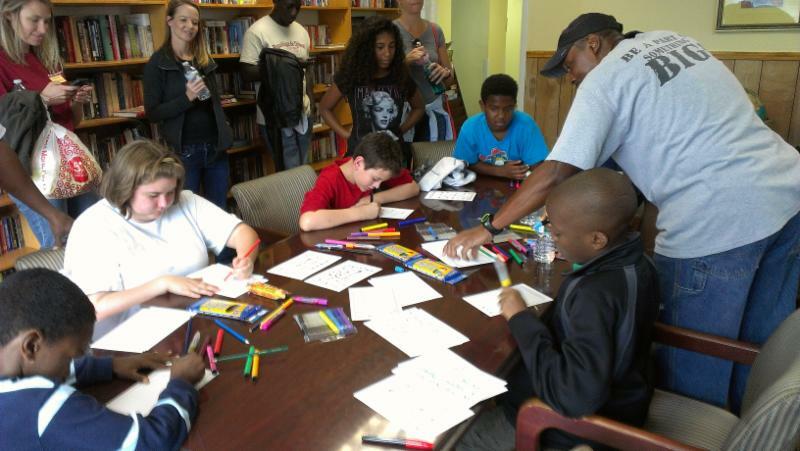 Big Brothers Big Sisters creating thoughtful holiday cards! Our seniors’ pets were not forgotten this past holiday season either! Dog Wood Park selected Aging True’s Pet Meals on Wheels program as their charity of the month for both November and December! 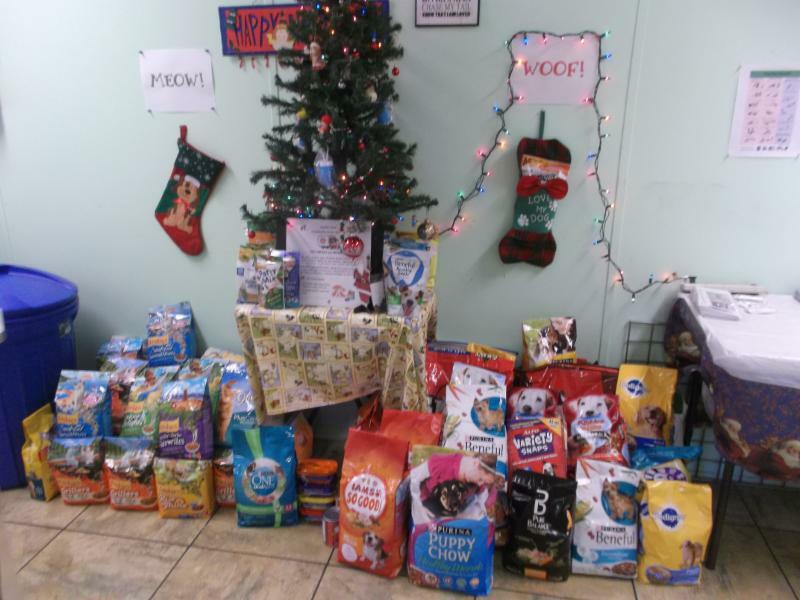 With their generous donations of over 100 bags and cans of dog and cat food, we are able to ensure our seniors’ canine and feline family members are fed! Aging True clients who typically would not receive a stocking or gifts for the Christmas holiday received a special treat thanks to the Jacksonville Bar Association and the Southside Women’s Club. For over 20 years, the Jacksonville Bar Association has sponsored a Senior Holiday Project and the Southside Women’s Club has knitted homemade stockings, stuffed with toiletry items. With help from Aging True client wish lists, 48 attorneys and law firms hand-delivered gifts to 314 seniors and an additional 120 seniors received the special homemade stockings. The fun didn’t stop there… Subaru retailers and Meals on Wheels of America have worked together since 2008 to raise money through their “Share the Love” event. 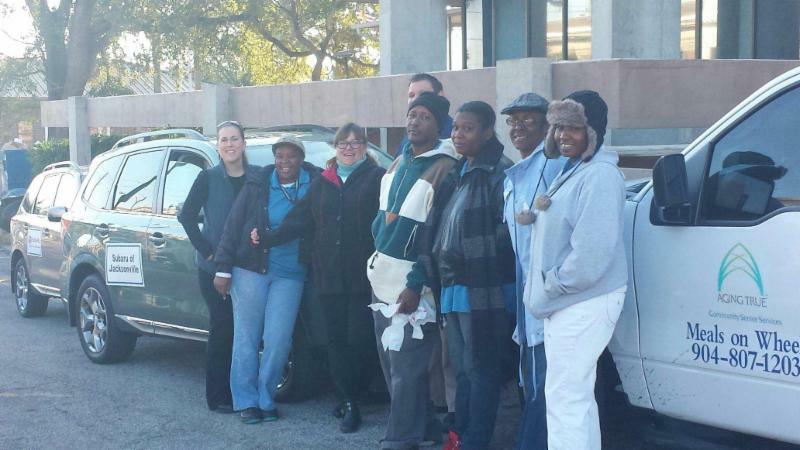 Locally, Aging True partnered with Subaru of Jacksonville associates as they delivered meals to clients in early December. We are honored to recognize and celebrate these amazing volunteers, companies, civic groups, non-profits and religious entities. We could not ask for a better volunteer support program and are excited for what 2015 will bring! Thank You Bi-Lo Holdings Foundation! ‘Tis the Season and indeed it was! Aging True is honored to have been awarded a grant to address hunger-related health and education issues. 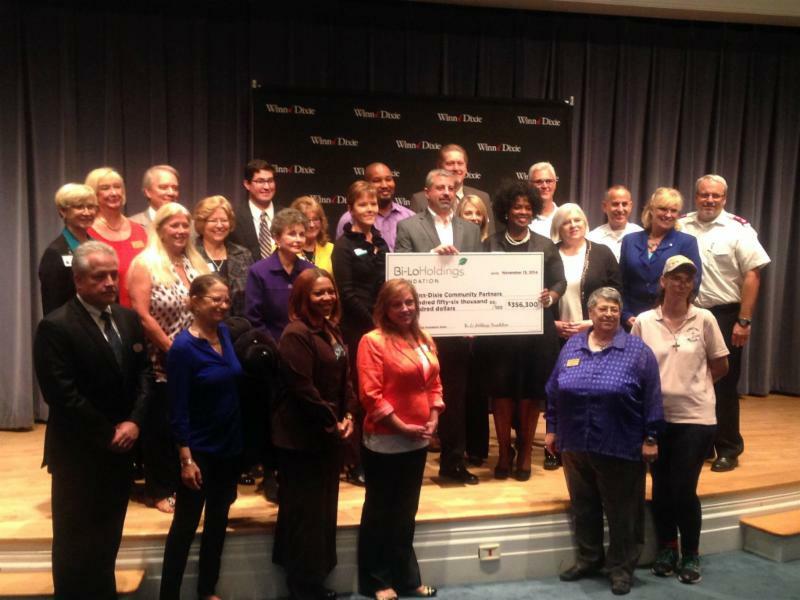 Winn-Dixie stores and Bi-Lo Holdings Foundation awarded a $25,000 grant to support Aging True’s Meals on Wheels program. The grant will provide an additional 4,000 nutritious meals to homebound, frail and disabled seniors in our community. In total, the grocery store chain awarded $356,300 in grants to 24 non-profits to in Northeast Florida! The Bi-Lo Holdings Foundation raises funds for grants through suppliers at their annual Charity Classic golf tournament and donations made by their associates. 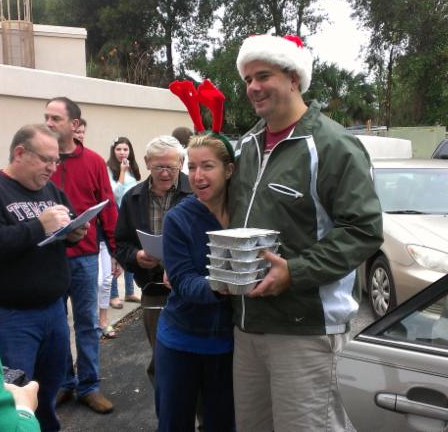 Every day, nearly 800 meals are delivered to seniors in Jacksonville by dedicated staff and volunteers. It is through the generous support of companies like Winn-Dixie and Bi-Lo Holdings, that Aging True is able to address the issue of senior hunger in our community. We thank Winn-Dixie and the Bi-Lo Holding Foundation for taking an active role in our community and supporting Meals on Wheels. Your generosity is greatly appreciated! Recently, one of our clients, Patricia Amato, opened up her home to help us spread the word about our Relatives As Parents Program of Jacksonville (RAPPJax) and how much it’s helped her. The program gives Amato and about 20 other grandparents, financial assistance for home improvements, regular “wellness” checks via telephone and a monthly support group where the seniors can discuss the struggles, joys, and challenges of raising their grandchildren. Caring for kids entering their teen years is proving stressful and just preparing them for school each day is a challenge, Amato admits. “You try having small kids and have all my medical problems,” she said. “I was like, ‘Help. SOS. I am stressed out! 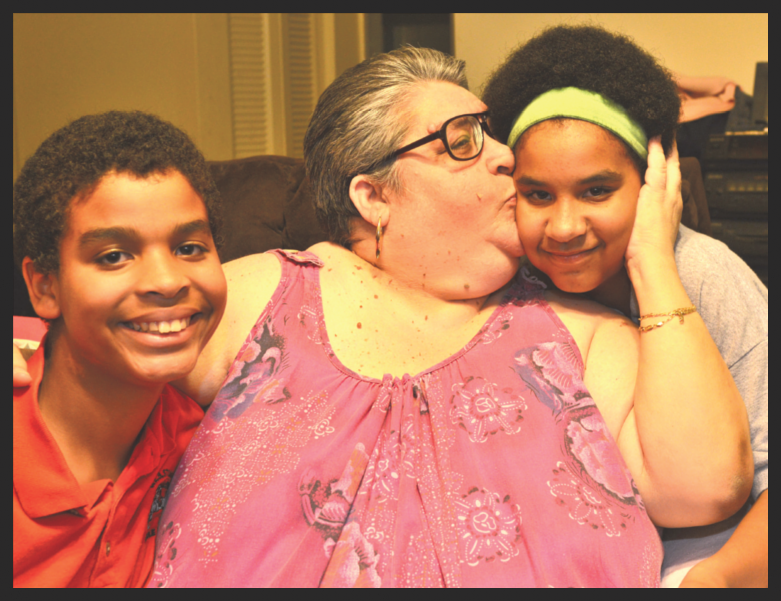 '” But Amato’s life – and the lives of her grandson and granddaughter, ages 13 and 12, respectively – is improving thanks to the grandparent support program. Any Duval County grandparent who is 60 or older and has custody of their grandchildren is eligible. Potential participants should call Sunshine Monk, Mental Wellness Programs Manager, at 904.807.1203 and ask for an in-home assessment by a program representative. There are no income guidelines for the program funded by the federal Older Americans Act. Please consider supporting Aging True. Your contribution will assist in maintaining and enhancing Aging True’s programs and services so that we may better serve seniors in our community. Mail your gift to Aging True, Attn: Development, 4250 Lakeside Drive, Suite 116, Jacksonville, FL 32210. To make a secure online contribution, please Click Here or call us at 904.807.1203.